Jordy's Beauty Spot: STYLE SPOTTING: Camel Colours, Bows and The Peter Pan Collar. STYLE SPOTTING: Camel Colours, Bows and The Peter Pan Collar. 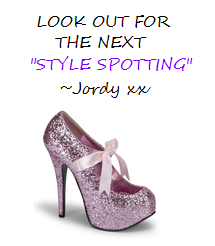 Welcome to the first of many in my new series "Style Spotting". In this series i point out some current fashion and beauty trends that i have noticed in magazines, on the runway or on the streets. This series ensures you stay up to date with the latest styles. I personally am in love with this camel colour and am glad it is recieving a lot of popularity. From the pictured i collated above you can see that this camel colour comes in a few different shades. There are cream, brown, peach and tan tones but they are all very neutral, tan colours which is what camel is all about. I actually love this colour and think its the new white; goes with everything and has a clean, effortless look but looks a lot more fashionable and put together. Who doesn't love bows and recently they have been everywhere. ; in hair, on accessories, tops and dresses. They add the girliest touch onto anything but still remains very tasteful. It's something that never goes out of fashion but i have especially been seeing a lot recently.